An arcade exclusive never ported, I was stoked to spot Golden Axe: The Revenge of Death Adder in an arcade. 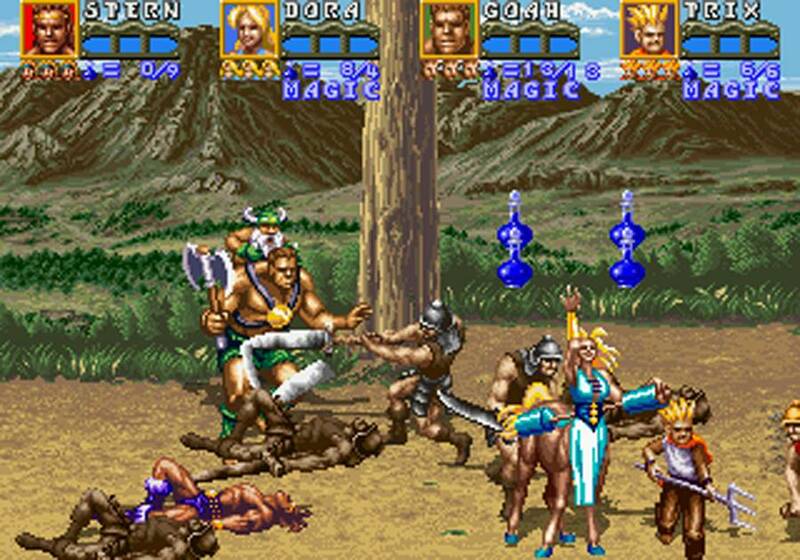 Golden Axe is a forgotten Sega franchise favorite. As a kid without a Genesis, I played the Target display model regularly, set to reboot every 2 minutes to piss off loiterers. So obsessed, I whipped Golden Axe 2’s 1st level hundreds of times and filled notebooks with drawings of the hooded Jawa-wizards. Despite coming a year after Revenge of Death Adder, Golden Axe 3 bridges the style gap between 1 and 2, and Revenge of Death Adder. Americans who never touched Golden Axe 3 (only on Sega Channel) will be surprised by Revenge of Death Adder’s mechanics. Larger sprites crowd the screen, limiting dash attacks, emphasizing jump attacks. Numerous enemies make play faster with less focus on anticipation. Essentially, it’s Golden Axe modernized into semi-Streets of Rage. 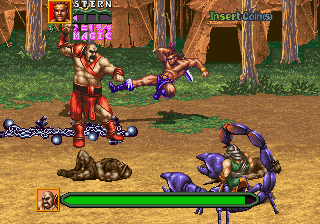 Golden Axe fans, don’t sigh—old school touches are abound. Expect a mostly classic magic system, hobbits that drop potions when beaten, life-robbing pits, mountable creatures in the form of awesome scorpions and praying mantises, and annoying resurrecting skeletons and twin fat brawlers. Even expect improvements! The 4 characters are cool and varied—one even has healing magic. There’s a throwaway Conan-clone, but also an imp kid, centaur woman, and Gilius Thunderhead (Golden Axe’s dwarf mascot) riding on a hulking ogre ala Master Blaster from Beyond Thunderdome. Plus branching paths—sort’ve. You eventually backtrack through the skipped levels, destroying the illusion of choice, but its heart is in the right place. And the new enemies, areas, and graphics are great. Like most beat ’em ups, Revenge of Death Adder is a cheap quarter-muncher, but let’s not damn the whole genre. For Golden Axe fans, Revenge of Death Adder is a fine update both new and familiar. I discovered this Beat-em-up gem in a Celebration Station in Tulsa, OK quite some time ago. I was in love! When I bought my candy cab, I immediately set out to find this board. After quite a search, I found one! It cetainly brought back awesome memories, but only so far as I could make it on the few tokens that I threw into that machine in Oklahoma. After the first 4 levels, the enemies get repetative and the hack and slash starts to wear thin. Don’t get me wrong, I love the franchise! But when you actually own the board and you no longer have to conserve your credits, you start to realize the repetative nature of these hack and slash quarter munchers. You’re right. I’m not arguing about how repetitive and quarter munching these games are. But to complain about it is to write off the whole genre. I agree, most beat ’em ups only have about 6 enemy types and go on way longer than they are supposed to. Also, the strategy involved in winning is very simple, typically you use 1 or 2 moves over and over again. That’s just the nature of the beast. The exception to this rule is 3 Dirty Dwarves which has a pretty clever tag team mechanic and puzzle-like enemies. Don’t you own a copy of that? Great game!